Millikin Basics+ is more than just basic academic skills. Millikin Basics+ students have fun, go on field trips, and love being at school. Millikin Basics+ students are kind, hard working and respectful. Millikin Basics+ teachers and staff do whatever it takes to help students become the best they can be academically and emotionally. Millikin Basics+ has a strong PTA that supports, field trips, academics, science, and puts on great family events all throughout the year. They support the school through fundraisers and with volunteer time. Millikin Basics+ Parents are very involved in their child's learning and success. Millikin Basics+ does focus on art, music, social skills and STEAM as an important part of the learning experience..
Millikin Basics+ accepts students of all backgrounds, abilities and status. All types of students are welcomed at Millikin. Millikin Basics+ supports students academically and socially and has a great support system for our struggling students. Millikin Basics+ has the largest elementary participation in Instrumental music. Millikin Basics+ has their own science and computer labs. 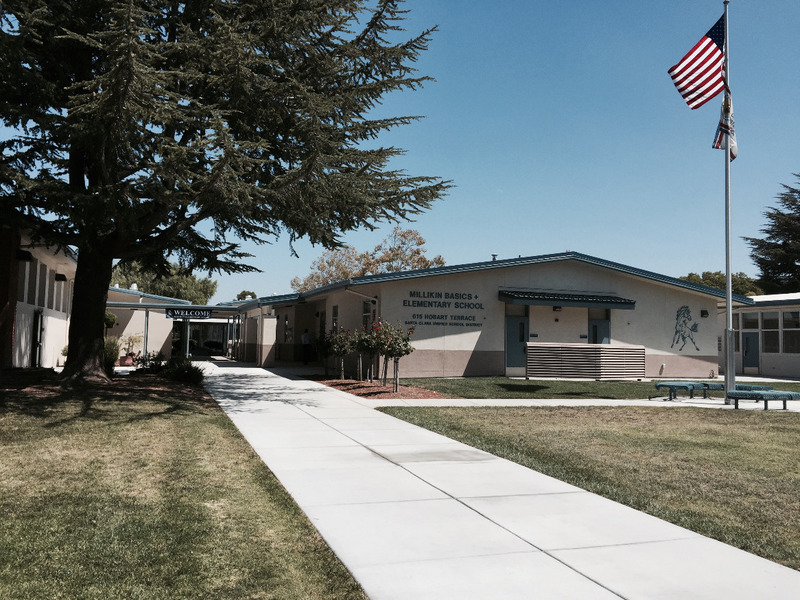 Millikin Basics+ is a school of choice in Santa Clara Unified. We are a lottery school. Each year we hold an Open Enrollment Lottery, Applying for Millikin is done during the Open Enrollment period held in early January through early February. Millikin Basics+ is a Uniform School. Parents voted to have school uniforms during the 2016-2017 school year. Millikin Basics+ is a whole class, direct instruction model with students sitting in rows. Millikin Basics+ is focused on teaching at grade level and mastering the academic skills needed at each grade and in each subject. Millikin Basics+ has enjoyed a long tradition of being one of the top academics scoring schools on all District/State/Federal assessments. Millikin Basics+ wants you to apply this January to join us for the 2019-2020 school year. Check out what programs are going on through Peachjar. Hello Parents, Safety Patrol reminders: Please make sure to approach school and the dropoff zones at a safe driving speed. Please don’t get out to help your students in the drop off zone. We ask you to wait and pull up. Greeters will help your children out and if they need something out of the trunk they can help with that too. Just POP the trunk. Make sure we think about the safety of our children. Better to be a few minutes late than put yourself or a child at risk for injury or death. Millikin Basics+ Elementary School is an alternative educational program open to all children in the Santa Clara Unified School District. The primary emphasis of the Basics+ program is the mastery of basic academic skills and establishment of good study habits. High standards of performance, accountability, and behavior are maintained. The program places greater responsibility on parents to develop the individual personal growth and responsibility of their children. The school places an emphasis on achieving proficiency in academic skills.